This is the ORIGIN of the “I am ObamaCare” picture. I’m the one who wrote it, photographed it and posted it on October 20, 2011. That’s me in the picture. This is my story. 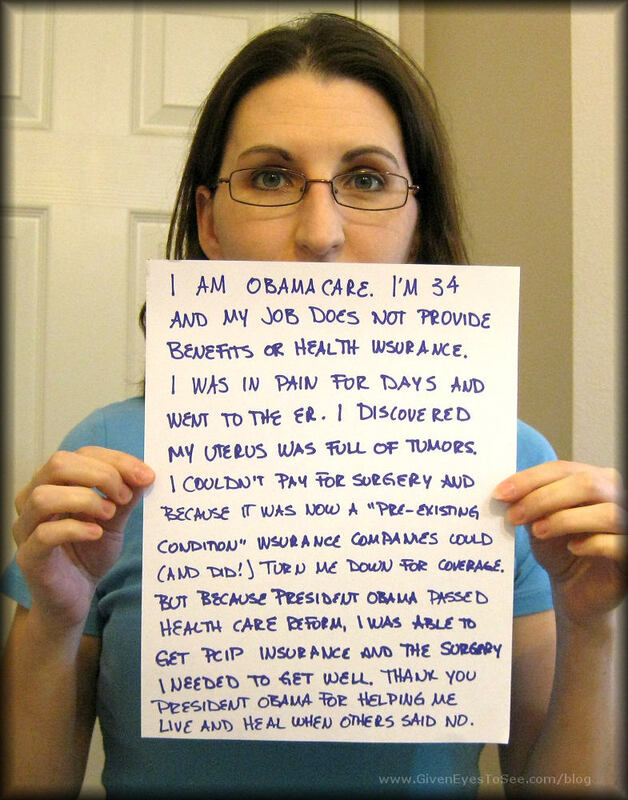 I never knew my simple “I am Obamacare” image would wind up all going viral on every corner of the web! I am happy for you to share my image anywhere but I would appreciate it if you credited it correctly. I keep seeing it incorrectly credited when I find it. And if you have shared it, please let me know. I’d love to see it. Thank you! I am ObamaCare. Thanks to President Obama’s Health Care Reform, I was able to get PCIP Insurance after I was diagnosed with a uterus full of tumors in the ER. This insurance allowed me to get the surgery I needed to get well. And since this single picture has made so many conspiracy nuts insane, see a FAQ behind the cut. Who’s the girl in the photo? Me, Miss M. Turner I am the originator of this photo. I made it, took it, posted it on my blog, twitter and facebook page. Since then, it’s gone viral and all over the web. You’re lying/Obamacare isn’t in effect yet!/I thought the Reform didn’t take effect until 2014? In 2014, regular insurance companies won’t be able to drop you or turn you away or disqualify you if you get sick. (Pre-existing conditions are already eliminated for children; adults have to wait a few more years.) UNTIL THEN, PCIP was created as bridge coverage. It gives people access to medical insurance when they normally wouldn’t be able to get it. For details: http://pciplan.com/ PCIP went into effect July 2010. Were you paid for this picture? Seriously? *snort* I can’t believe people actually think that. No, no one paid me anything. I’m not affiliated with any campaign or group. If, however, you want to help support my cause and help me put a dent in my medical bills, I have a donation link here and my sole income right now is through my small jewelry business here. I would also appreciate any links to my shop as well. Why did you make this? Because I’ve seen all the “I am 99%” pictures lately and thought I’d do my spin on it because this is what is going on in MY life. Uterine fibroid tumors are typically benign and common. Why surgery? It’s true that they are VERY common and almost always benign, however, hysterectomy because of fibroids is one of the most common surgeries, period. Fibroids can cause not only severe bleeding, extreme pain, anemia, infertility, and sexual pain and discomfort, but can cause bladder issues as well as bowel issues. I had FIVE fibroids of massive size (over 1,200 grams when this started or approximately 2.6 pounds) that made my uterus the size of a woman 4-5 months pregnant. The pain was extreme and they pressed on nerves in my back as well. The ONLY cure for fibroids is uterus removal – hysterectomy. In ALL other treatments they can (and do) grow back. Given the quick growth and massive amount of tumors, it made sense to go with the permanent option rather than remove the tumors only because in 3-5 years, I’d have to do it again. My fibroids were everywhere in my uterus; inside, in the lining and even outside the uterus. I was never going to be able to have children because of the damage that would be done removing them, so I opted for a hysterectomy to cure me of the problem. I had my TLH – Total Laparoscopic Hysterectomy – on October 5th. The surgery removed my uterus and my cervix but retained my functional ovaries to prevent menopause. I am very slowly healing. But I am thrilled to know that soon I will have not only my life back, but better than before! To think, soon, I will be healthy. It’s a beautiful thought. I applied for every single charity/state assistance program there is in Florida. I got denied for all of them. In Florida, it’s all tied into the Department of Children and Families and if you are not pregnant and do not have kids, you do not qualify for Medicaid. Period. How ironic is it that here I was, unable to have kids because of tumors and denied for assistance? My ER stay was $13,347 and was “discounted” down to “$8,008” for being a “cash” payment. That’s not exactly a manageable number either. On top of that, I also have $1,200 to the ER physician and $250 to the ER radiologist that were billed separately. And that was just a single overnight ER trip! Can you imagine the cost of surgery and inpatient follow-up care?? As a cash paying patient? It’s utterly impossible. Edit to add: See this entry for the cost of just the hospital bill for my surgery. You know it’s not actually called “ObamaCare” right? Uh, yeah. That’s kinda the point. I’m using the negative term in a positive light. It helps draw attention to it in a more polarizing way. It’s like an intentional irony. Well, I rather have Single Payer system! I too wish we had gotten MORE reform passed. As long as health care is allowed to be a for-profit system, it only works if people stay sick. And that’s fundamentally wrong. But President Obama has given us the first real health care reform – ever. And while things like PCIP aren’t perfect, it’s a step in right direction and it gets us closer to the goal of health care for all. I don’t want to pay your handout! PCIP isn’t a handout and it isn’t free. It’s insurance no different from yours, except mine is probably more expensive since I’m paying all the premium instead of splitting it with an employer. I pay $237/month just in premiums, had $1,000 deductible to meet and I pay 20% of all services as well in co-pay. You can read up on the entire process on my blog. I’m relying on my small jewelry business to help pay the medical bills, so please check it out. Thanks! This totally needs to be a facebook post so people can share the heck out of it!